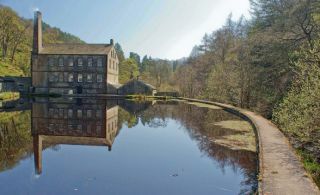 One of the very first mills to launch the Industrial Revolution in Britain, Gisbon's Mill stands in a superb countryside location in Hebden Dale, beside Hebden Water. The mill also stands within the wooded valley known as Hardcastle Crags, offering 18 miles of walks through marvellous countryside. 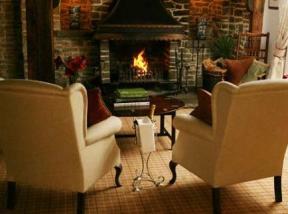 The mill, also known as Lord Holme Mill, was built about 1800 to produce cloth from cotton. The mill was driven by an internal water wheel, taking advantage of the tumbling force of Hedben Water. The mill is known to have employed 21 workers in 1833, and each employee was expected to work 72 hours per week! The mill ceased operation in 1890, and was used as an entertainment centre by local inhabitants, who installed a cinema, dance hall, and roller skating rink, among other facilities. The mill was largely derelict following WWII, but has now been testored so that visitors can take a glimpse into the Industrial heritage of the area through hands-on exhibits. Visitors will also learn more about the Hardcastle Crags area and the recreational opportunities it offers. Location: At the end of Midgehole Road, 1 1/2 miles north-east of Hebden Bridge, off the A6033. SatNav users use HX7 7AA for Midgehole car park, HX7 7AZ for Clough Hole car park.